Head teacher: Ms Joan Marshall introduces Hertford Juniors on their website; We are a small school, set in beautiful surroundings, with spectacular views in every direction. 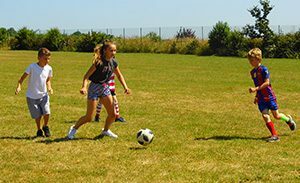 We have excellent facilities, including an ICT suite, as well as lots of outside space, including our own field. We serve the community of Hollingdean, where most of the children who come to our school live. We have good links with the other schools in the area, including Hertford Infant School, and are developing links with our other partners in the community. Currently there are 189 children on roll and small classes. We have 34 staff altogether, including: teachers, teaching assistants, office staff, kitchen and cleaning staff. Each member of staff has an important role to play in the school and is highly valued. 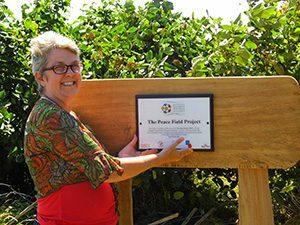 Tony Pearce, Hertford Junior School, Support Staff, writes; Thank you to Mick Gale (NCFA, Peace Field Ambassador) and all the school’s staff, for a fantastic Peace Field twinning event Saturday 30th June, 2018, it was a lovely day and it was wonderful meet the erudite Mick Gale. It was brilliant for me personally to see such a worthy project impress all the participants and their parents. Saturday was just the start for the legacy of our peace pitch, future school sports days will be played in the spirit of the Christmas Truces, advocating friendship and sportsmanship. The kids and parents will get to see the plaque in situ for the first time at their sports day. 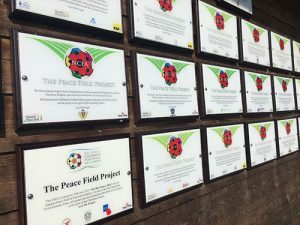 Hertford Juniors have made a commitment to promote fair play through the Peace Field Project and continue cooperating on this fabulous project. I know the kids would love to hear the NCFA’s Mick Gale football stories and learn, more about the Christmas Truces. The fact that all this happened in the middle of such an exciting 2018 World Cup was a nice coincidence! 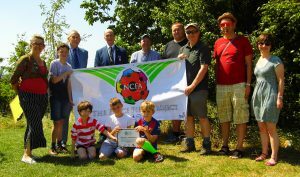 Thanks again to you and everybody at the NCFA for making this happen – it puts a spring into the school’s step when something like this actually works out for the greater good of learning through play!